What I Blog About When I Blog About Books: 12th Day of Christmas: China Glaze "Mrs. Claus"
Happy 12th Day of Christmas Manicure! We are officially halfway there! (technically .5 days to go, but that's not entirely relevant in these terms so I'm going to say we're halfway anyway). 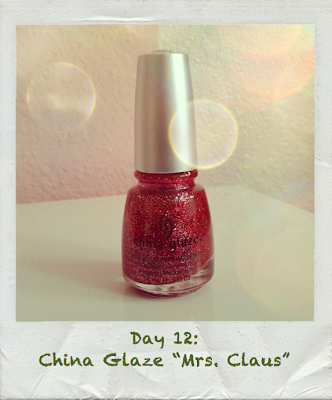 And for today's nail of the day, I have a single-polish manicure, China Glaze's "Mrs. Claus." "Mrs. Claus" is a unique holiday glitter, leaning pink rather than red like most. It is a full glitter polish (so it's not great for trying to layer polishes) with a base that is also tinted pink. It's a silver-pink, so it is definitely a cool color. I like this polish when I start tiring of all the red glitters out there (which doesn't happen too often). It's also great if you're someone who is shy towards sporting bright reds. The pink makes it slightly more wearable. This polish has remained as an important component in my holiday polish collection. It's not one of my favorite ones, but I still return to it every holiday season. :D This feels like a mixture of zoya "astra" & avon "ruby red slippers," predominantly silver.